First strategy will hunt down strong price movements. It will then start opening multiple trades in the direction of that trend. The trades will either hit Take profit or Stop loss, or the EA will close the group of trades when it exceeds a certain profit. It is NOT a grid system and will only place extra trades if the momentum of the trend is continuing. If there is a reversal in the trend, it will not add extra trades. Second strategy will try to catch these trend reversals. 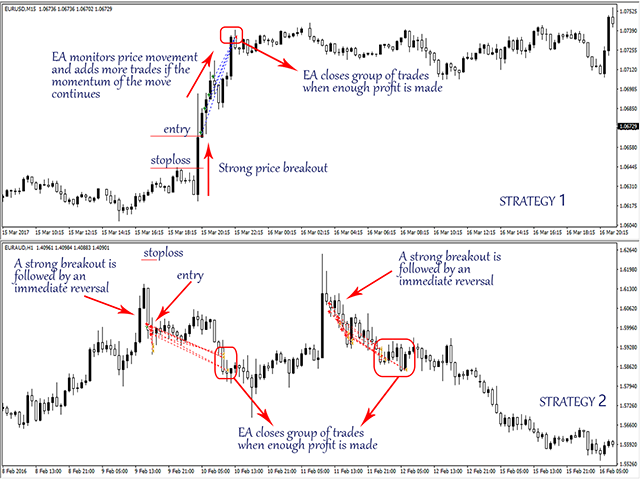 Also with this strategy, the EA will open multiple trades if the reversal trend is strong. This BOA version will run the Best Of All version from the MT4 original, a selection of the very best from the original bestseller. It can be set up fully, running 14 pairs on 4 different timeframes, from a single chart using the OneChartSetup option! All trades have stop loss at a safe, but not too far distant. Protecting capital is rule number 1 in trading. Even if price doesn't reach the take profit levels, the group of open trades can still close in profit. So we don't always need the trend to be very strong to be profitable. Proved money-management techniques, used in all my EA's. This is a long term EA, which does a lot of trades, but it will not trade every day. Only when strong price movements are detected, trades will be opened. The EA is very versatile: it can be used and optimized on multiple timeframes and for multiple pairs. More timeframes and pairs will become available in the future. This EA uses pure PRICE ACTION (price movement) for entering trades. No lagging indicators are used. The EA has an "automatic settings loading" system build in, so it will automatically select the best settings for the pair and timeframe. The EA is very limited influenced by spread or slippage, so it is safe to run in almost all market conditions and trade-account types. The EA can do a lot of trades, so it is also very interesting to use it for rebates! OneChartSetup = when true, the EA will run all 14 pairs from a single chart. When false, the EA will only run the pair from the chart. 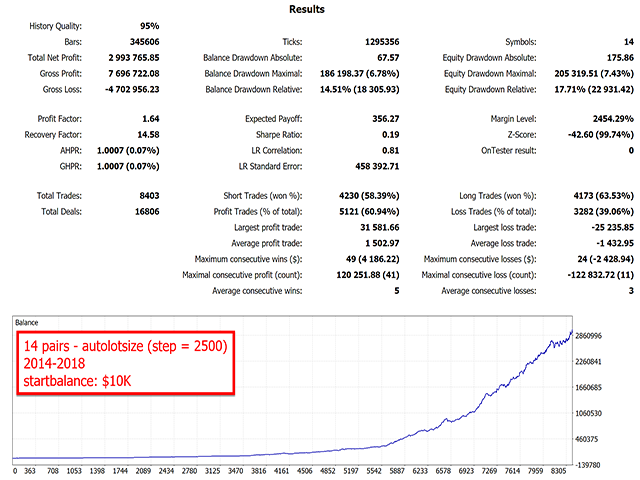 I have been trading Forex for more than 10 years and have been developing EA's for more than 3 years. 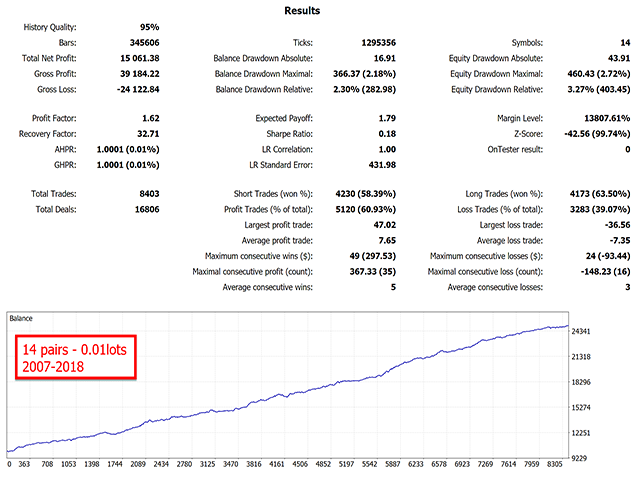 All my EA's must always meet certain very strong criteria: live results must match the backtests; the EA should be as independent as possible from different market conditions (such as spread, slippage); EA's should follow simple, but powerful logic that works long term; EA's should not be over-optimized and should work even when parameters are changed; EA's should ALWAYS use a Stop Loss which risk only very little of the account. It is a very good product. The best!